The Hindu Society of Manitoba was incorporated as a Religious Charitable Society in 1970. Weekly Sunday prayer meetings started in early seventies at devotees’ homes. It moved to International Centre and then to Liberty Church at 854 Ellice Avenue. Friends and devotees came together to renovate Liberty Church into a beautiful Hindu temple. On Diwali night of October 1979 the Hindu Temple was opened for worship. 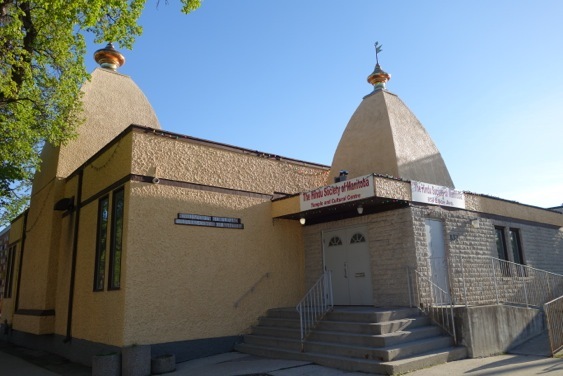 This was the beginning of first Hindu community place of worship in Manitoba. In 1984 the temple was further expanded to North and East sides. 854 Ellice Avenue site is holy and blessed place of worship since the forties, first as Church and since then as HINDU TEMPLE where devotees congregate to seek love and peace. Guided tours will run throughout the day, lasting 15 minutes, maximum 15 participants.